All right, now that we have all shrugged off that post-ABQ Beer Week sluggishness, it is time to get back out there and be a little adventurous. I suppose if you were feeling really crazy you could drive to Flagstaff for the Made in the Shade Beer Festival on Saturday, but sadly my friend out there has to work (it’s her birthday no less), so I will be here. What to do? Well, if you are in the vicinity of Santa Fe Brewing around 2 p.m. on Saturday, stop in for the Babes in Brewland’s tapping of “Babes and the Giant Peach.” For the second year in a row, they brewed up a pale ale with a copious amount of peaches thrown in and SFBC will be hosting the release. Remember, these ladies did just defeat the Crew (and three other beer groups) at the Battle of the Beer Geeks, so they know what they are doing when it comes to making good beer. Plus, you can always stay and drink more of that wonderful Highland Heath, the crazy barrel-aged Scottish ale that is the third entry in the Ever Changing Series. If you cannot get out of ABQ, then head over to Tractor Wells Park for the after-party of the Pride Parade. Rebels with a Cause is the show and it runs from 6 p.m. until 2 a.m., featuring live music from Black Widow Cabal, Sugar Babies, Mondo Vibrations, Lindy Vision, and DJ Dirt Girl, plus additional entertainment, vendors, food trucks, and more. There are only a few new beers at the breweries around town. Boxing Bear knocks it out of the park with the latest batch of Sucker Punch DIPA. Chama River has the new Sage Saison, plus old favorites Red River Ale and Chamahawk Xtra Pale Ale return. Kaktus gets into the saison, er, season with Jaison. La Cumbre’s Acclimated IPA returns Monday. Marble went and put their Red Ale on nitro downtown. Up in Santa Fe, Second Street has fresh batches of Bastogne Belgian Stout and Mosaic IPA. And on the subject of cask beers, rather than listing them brewery by brewery in here, we’re doing something a little different. Since oftentimes breweries don’t know what they’re putting on cask until the day of (usually Friday), rather than just put “TBD” down below, instead we’re offering updates via our Facebook page and Twitter feed. Look for the “Firkin Friday” post every week on those social media sites. One of these days when we get around to upgrading the main website we will make it a permanent feature on there, but for now we’ll provide live updates as the breweries get us the information. Continue reading for all the news that is fit to blog for the week of June 1. Beers: Call the number for an up-to-date beer list. ABP carries beers from Rio Grande/Sierra Blanca. Several times a year, ABP serves up the latest creation by local brewing hero and winner of the Samuel Adams Longshot competition, Ben Miller, or seasonal releases by Monks Brewing. Beers: Barefoot in Barley, SuMariOatmeal Stout. Located at 8620 Pan American Blvd., on the east side of I-25 and between Paseo del Norte and Alameda, ABC is now open and ready for business. In addition to the house beers, there are often guest taps, plus the plan is to have at least one beer on a nitro tap at all times. For more info on ABC, you can check out my advance preview. The Barefoot is a S.M.A.S.H. beer. Beers: Malt Tonic, Cali Common, Belgian Wit, Ameriweiss, Ladron’s Peak, Pre-Prohibition IPA. The Ladron’s finally went back on tap recently. Friend of the Brew Crew Lonnie said it’s a big old blast of juniper this time around. The Ameriweiss is a pre-Prohibition American sour wheat. The Pre-Prohibition IPA is back for another run. Beers: Bow Bridge Ale. The Bow Bridge (6.8% ABV, 64 IBU) is a new English Pale Ale. BG goes through their beers fast, so hurry out to try the Bow Bridge. If you have not made it out there yet, the Grasshopper is located at 4500 Arrowhead Ridge Road in Rio Rancho, just off Highway 528. News: Next up on the beer list is a Belgian-style IPA. UPDATED >>> Beers: Hop Chocolate Pale Ale, My Cheating Tart, EKG Pale Ale, The Last Straw, Bosque Pale Lager (San Mateo and Las Cruces), Old Man Jameson on nitro. All beers listed are on tap at all three locations, unless noted. The Pale Lager (5.4% ABV, 45 IBU) was brewed as a traditional lager and then they went with dry hop additions of El Dorado, Centennial, Citra, and 7C’s during the whirlpool. Riverwalker IPA (6.5% ABV, 90 IBU) is now the permanent IPA on tap at all Bosque locations. The most recent additions are the EKG Pale (5% ABV, 25 IBU) and The Last Straw (5% ABV, 12 IBU), a hefeweizen. The other seasonals are Hop Chocolate (5.4% ABV, 30 IBU), a pale ale brewed with cocoa nibs added for a unique mix of the bitter hoppy and sweet chocolate, and My Cheating Tart (5.1% ABV, 15 IBU), a wheat-based sour beer made with the new Mandarina Bavaria hop. Welcome back to the Old Man Jameson (5.2% ABV, 18 IBU), a Scottish export ale now on nitro at two locations. Cask: From now on, Bosque will have their firkin filled every Wednesday, available only at Nob Hill. This week’s beer is Riverwalker IPA infused with green chile and sage. Beers: Irish Red, The Other Red, Hefeweizen, Dark American Lager, Saison, Big Red Fez, Hopspitality IPA, ScRUMtralesecent, Hoppiness Envy, Hoppyweizer. Three beers that debuted during ABQ Beer Week are still available. The ScRUM is Canteen’s Stock Ale aged in rum barrels. Hoppiness Envy was created in collaboration with Bosque. It is the kind of IPA that hopheads would fight through an army of zombies to obtain. The Hoppyweizer is a hopped-up wheat beer created in collaboration with the team at ABQBeer.com. Other recent additions are the Saison and Big Red Fez, a rich, malty Belgian Red Ale. The Hefeweizen (6.2% ABV, 14 IBU) is a good example of the classic style. The Other Red (5.6% ABV, 26 IBU) is quite tasty, just a tad different then the Irish Red, with a little more hop kick. Beers: Sun Dog Kolsch, Red River Ale, Chamahawk Xtra Pale Ale, Sage Saison. Sun Dog is back for another run just in time for the temperatures going up outside. The Chamahawk and Red River are also back just in time for summer. The new Sage Saison (6% ABV, 20 IBU) is the latest entry in the summer of saison at Chama. Beers: Helles, Bier De Garde, ESB, Amber, Chinook IPA, Black Beauty Stout, Irish Red, London Porter, Jaison, Sweet and Dry Apple Cider. The Jaison is a special saison, offering up a tangy, spicy medley of flavor. The most recent additions before that were the Helles, Black Beauty, and Cider. The Black Beauty is a sweet, creamy stout that is not too thick for the warming weather (well, we assume the weather is going to warm up here at some point). Kaktus is located at 471 South Hill Road in Bernalillo, for those who have still not made the trek. Beers: Saison D’Hommel, Hop-Back Centennial Pale Ale. A recent addition is an old favorite in Saison D’Hommel. Got an update from La Cumbre brewer/owner Jeff Erway. They are working hard on cranking out some new seasonals on the new brewhouse, but it may be a little while. The first new one is the Hop-Back Centennial, which is the first in a planned series of Hop-Back pale ales, assuming Jeff can get his hands on lots of whole leaf hops. In the interim, you can also look for a lot of special beers to be brought out of the cellar for your enjoyment. The next new beer, which is an old favorite returning, is Acclimated IPA, a wonderful DIPA due back out this Monday. Brace yourselves for the hop punch to the jaw. Oh, and don’t panic about Project Dank and Red Ryeot no longer appearing here as seasonals. They are now part of La Cumbre’s regular lineup. Red Ryeot cans are now for sale around town and at the brewery. Events: Moonhat performs Saturday from 7 to 10 p.m. Beers: Call the brewery for an updated list. We haven’t gotten an update from Lizard Tail in a good long while, and they aren’t really updating their Facebook page, either. Guess we will have to go over and see what’s up. Oh, darn, we’ll have to drink beer. Beers: Both locations — Maibock, Fuego, Imperial Red; Downtown only — Weizenbock, White Out, Rauchbier, Imperial Red; Westside only — Double IPA, Brett IPA. We now have a breakdown of which seasonals are available at both Marble locations, Downtown and Westside. Fuego is a chipotle-infused version of the Rauchbier. The most recent additions before that were the Weizenbock (7% ABV) and Maibock (7% ABV). The Brett IPA (6.8% ABV, 93 IBU) and White Out (9% ABV, 40 IBU), Marble’s seventh anniversary ale, and both are also available in bombers. The Rauchbier (5.2% ABV) is a smoky delight. In live music this week at the downtown pub, Cafe Bomba performs tonight (Wednesday) from 5 to 8 p.m. Markland will take the stage Thursday from 7 to 10 p.m. The Jir Project performs Friday from 8 to 11 p.m. Saturday features Boris McCutcheon & the Salt Licks from 8 to 11 p.m. The Squash Blossom Boys perform Friday from 6 to 9 at the Westside Taproom. Gabriel Tafoya will be out west Saturday from 6 to 9. Beers: T.N.G. Porter, Night at the Roggenbury, Q’s Omnipotent Wit, Prosperity Works Belgian Scottish. For someone who once said she was not good at naming beers, Kaylynn has come a long way with the various Star Trek-themed names, the latest being Q’s Omnipotent Wit, a new Belgian-style witbier. Another recent addition is the T.N.G. (6% ABV, 30 IBU), a smoked porter. Night at the Roggenbury, a collaboration beer with Turtle Mountain, is still available. The Belgian Scottish was the Beam Me Up Scottish made with Belgian yeast. One dollar from each pint sold goes to Prosperity Works, a local charity. UPDATED >>> Beers: Pre-Prohibition Pilsner, ESB, Tropical IPA, Amarillo Red, Bourbon Vanilla Porter, PiPA. We got an updated beer list at last! Now we will have to go over try some of these. The Bourbon Vanilla Porter is an old favorite amongst the Crew. It would be nice to see how the Pre-Pro Pilsner compares to Back Alley’s past offering of that style. The Tropical IPA and Amarillo Red also call to us. While Pi Brewing is not open to the public yet, they are able to brew and serve their beers next door at Nicky V’s. We’ll keep tabs on when Pi itself opens. Beers: (Regular) Ghost Train IPA, Rip Saw Red, Crosscut Kolsch; (Seasonal) The Phantom Conductor II, Zwickel Pils, Brunch Stout, Rosa’s Gose, Midnight Kolsch, Bavarian Belle, Rauchweizen. Ponderosa is located at 1761 Bellamah NW, which is just east of Rio Grande and due north of the NM Natural History Museum, in the bottom floor of a swanky-looking apartment/retail complex (they have a sign atop the building now that you cannot miss). The Midnight Kolsch (4.3% ABV, 24 IBU) looks like a dark lager but still tastes like a sweet, light kolsch. The second version of the Phantom Conductor DIPA (8.2% ABV, 110 IBU) is still a big old hop bomb. If you are looking for something lighter, the Zwickel (4.7% ABV, 42 IBU) and Bavarian Belle (4.8% ABV, 15 IBU), a hefeweizen, should fit with the warming weather. The Brunch Stout (4.4% ABV, 40 IBU) and Rosa’s Gose (4.7% ABV, 15 IBU) offer up totally different flavor experiences. The smoky Rauchweizen (5.3% ABV, 17 IBU) earned high grades from folks when it debuted during ABQ Beer Week. Events: There is live music at Ponderosa as R.J. Perez of Ziatron performs Thursday from 6 to 8:30 p.m. Mike Hogan then takes the stage Saturday from 3 to 6 p.m. Beers: (Regular) Gateway Blonde Ale, Roamer Red, Threshold IPA, Paint it Black Milk Stout, Unhinged Cider, Trappe Door Wheat. (Seasonal) Broken Arrow Pale Ale, Baby Got Bock, Vanilla Cream Ale. The new Vanilla Cream should get you in a summer mood. For the first time, Red Door tapped a lager and it is excellent as the Baby Got Bock (7.5% ABV, 18 IBU) hits all the right maibock notes. The Broken Arrow (5.4% ABV) was made with just Equinox hops for a rather unique, yet multi-faceted, flavor profile. Events: There is no live music listed for Saturday, but if you head out between 11 a.m. and 4 p.m., you can catch the Los Angeles-based Thai food truck Pranom. They are stopping in ABQ to showcase their culinary skills. Saturday morning will mark another round of Beer and Breakfast. From 7 to 10 a.m. you can gather with friends for some food truck-supplied goodies with a pint of beer. Monday will feature Alex Maryol performing live from 7 to 9 p.m.
Events: Throughout ABQ Beer Week, SCG will have a daily smoked meat and beer combo special. We will have the full, mouth-watering schedule with our daily ABW previews. UPDATED >>> Beers: Barnstorm Ale, C+C IPA, Farmhouse Saison, Barley Wine, Tupac Cali Red, Dry Apple Cider, Pear Cider, Berry Cider, Sour Cherry Cider, Half-Acre Hefe (Wells Park only), Billy’s Basil IPA (Wells Park only), Belgian Blonde (Nob Hill only). Tractor has revamped their beer list and pricing system. All of the Tractor Classics — Farmer’s Tan Red, Double Plow Oatmeal Stout, Almanac IPA, Sodbuster Pale Ale, Haymaker Honey What, plus now Pilsner #15, Mustachio Milk Stout, and Apple Hard Cider — are priced at $4 apiece ($3 for Beer Farmer’s Co-op members). All seasonal/specialty beers will now be $5 ($4 for members). Just about everyone in town has slightly increased prices in the past four months, but an extra 50 cents or a dollar shouldn’t bankrupt anyone, right? Anyway, on the seasonal front, Half-Acre Hefe (6.2% ABV, 10 IBU) is back just in time for summer. The popular Tupac Cali Red (6% ABV) is also back for a second run. Another recent addition is the Saison (7% ABV, 25 IBU), an old world-style beer brewed with lemon and orange peel. That followed the Belgian Blonde (6.5% ABV, 33 IBU). We’re sensing a theme this spring. The popular Barnstorm Ale (5.8% ABV, 41 IBU), a maibock, is back. The 2015 edition of the Barley Wine (9.5% ABV, 65 IBU) is a giant malt monster, not too boozy but just enough to remind you that a few of these will leave you babbling alone in the corner. And if you have friends who are living the gluten-free life, you can take them with you to Tractor and let them choose between five ciders, the standard Apple Hard Cider and four new seasonals in the Dry Apple, Pear, Berry, and Sour Cherry. Events: Art Fusion for a Cause is back at Wells Park tonight (Wednesday) at 8 p.m. See the Wells Park Facebook page for more details. The pLOUD Music Series is back at Wells Park this Thursday as Innastate performs at 8 p.m.
Our favorite belly dancers, the Desert Darlings, return to Wells Park for another edition of Hops and Dreams this Friday at 9 p.m.
Saturday will feature the Happy Gland Band at noon. See our main intro above for the Rebels with a Cause event at Wells Park. Beer and Bellies is back at Wells Park on Tuesday at 7 p.m. 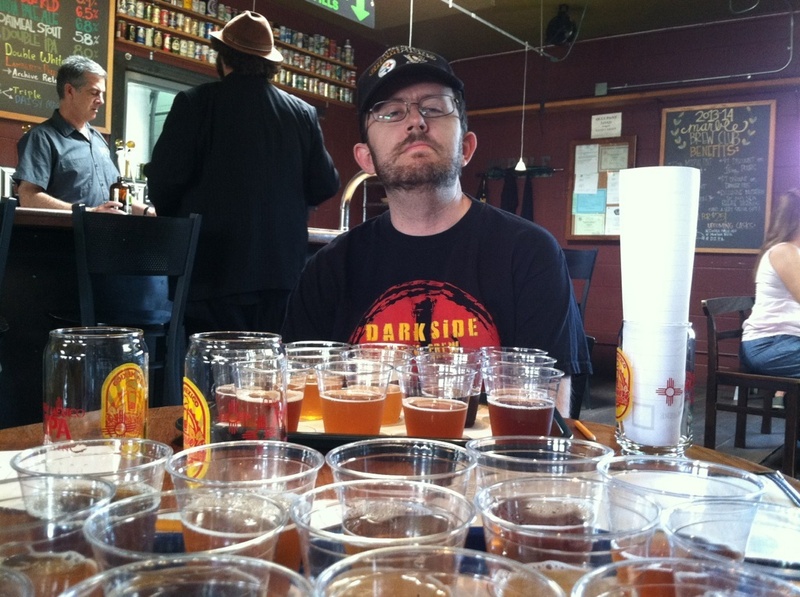 Beers: Keenendrem, Almanac, Velo IPA, Bogged Down. The most recent addition is Bogged Down, a cranberry cream ale. Another recent addition is the big hopped Velo IPA. The Keenendrem is a Belgian black ale brewed in collaboration with Duel. The Almanac is a dry-hopped farmhouse ale. News: An imperial red is next on the docket. Beers: Whistler (Petit Blonde), Bad Amber, Fiction (IPA), Fantin (Double Pale Ale), Titian (Golden Strong), Grunewald (Imperial Porter), Stille of the Night (Belgian Dark Sour), Cezanne Printemps (Imperial Saison), Keenendrem. The Stille of the Night debuted at WinterBrew to plenty of acclaim from the folks in attendance. The new Cezanne promises to keep up the tradition of big, big beers from Duel. Fiction is back after a short absence. Beers: Belgian Stout, Black IPA, Chicken Killer Barley Wine, Freestyle Pilsner. The Belgian Strong is out and the Belgian Stout has replaced it. The Kriek, which won a bronze medal at GABF this year, is on sale around the state in bombers, but supplies are low. A new Single Barrel Sour can also be purchased in bombers. A fresh batch of Chicken Killer is now available, too. The Freestyle is now available on tap and in cans across the state. Next up in the Ever Changing Series is Highland Heath, a Scottish ale that’s like nothing you have tasted before. It debuted back at Blues & Brews and will be on tap around the metro area soon. Beers: Kolsch, IPA, Cream Stout, Rod’s Best Bitter, Boneshaker Bitter, High Wheeler Pale Ale, Mosaic IPA, Bastogne Belgian Stout. Welcome back to the popular Mosaic IPA and Bastogne Belgian Stout, which both rejoined the lineup this week. The Pivotal IPA and Boneshaker Bitter are often available for purchase in four-packs of cans. Events: Live music is back this week at both locations. At the original location, Detroit Lightning, a Grateful Dead tribute band, plays Thursday. 50 Watt Whale plays Friday. Saturday will feature the Busy McCarroll Band. Over at the Railyard location, Moscow Mules will take the stage Friday. Alex Maryol will perform Saturday. Sunday will feature The Shiners Club Jazz Band. Beers: 790 IPA, KC’s Traditional Irish Stout, Swartzbar Black Lager, Maibock. Located in Socorro at 115 Abeyta St. W, Twisted Chile is the first brewery there to brew on site since Socorro Springs outsourced their brewing to Eddyline in Colorado several years ago. I got to head down there recently and enjoyed all the beers I sampled. Kudos to Twisted Chile for bring quality craft beers back to a town that needed ’em. The newest beer on tap is the Maibock. The Irish Stout came in third in our Stout Challenge. Hopheads still have the 790 IPA (7% ABV).